Jack Stone, the director/apiarist of Bee One Third. Photos courtesy of AMPLFY, Five Mile Radius, Mammojo, Espresso Train Café, Food Connect and Bee One Third. 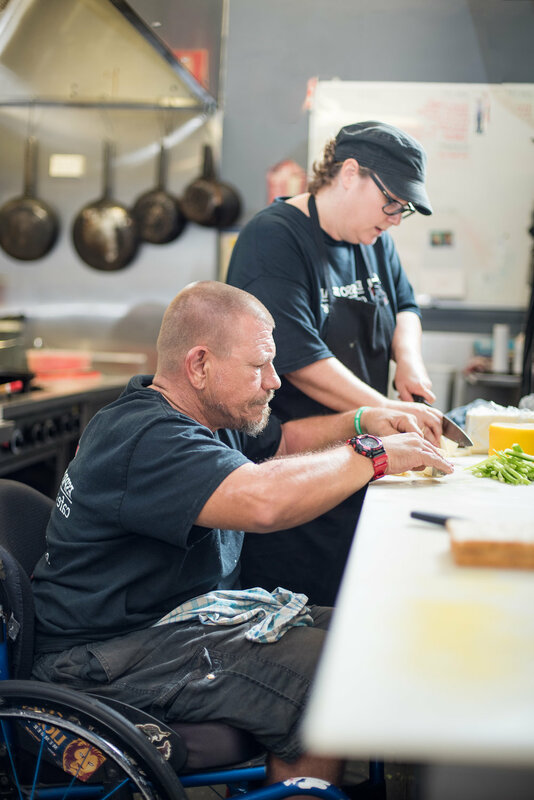 In December 2018 Matters Journal took readers on a walk around Melbourne, showcasing some of the many social enterprises blossoming in the city. Now we’re heading north to the state of sun, sand, surf and .... social enterprises? Apparently so. Brisbane’s relatively younger grassroots social enterprise movement is booming, says Tom Allen, CEO and founder of ImpactBoom, a Brisbane social enterprise with a mission to support and develop fledgling social enterprises. Many of the city’s diverse range of businesses doing good are alumni of ImpactBoom and Brisbane City Council’s collaborative Elevate + accelerator, a program that helps would-be social entrepreneurs realise their vision and connects them with a community of like-minded others. So let’s meet some of them. One of AMPLFY’s DIY bluetooth speakers. 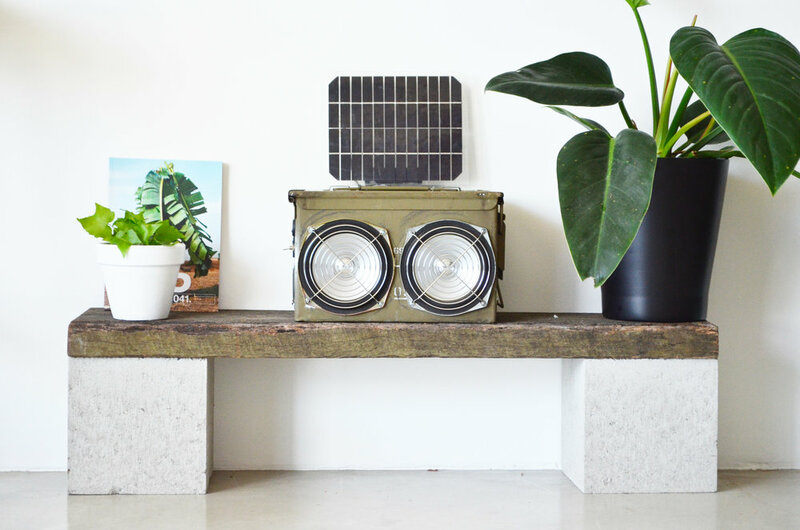 AMPLFY began with a clear and simple vision: “to produce one-of-a-kind audio systems, at a fraction of the cost without impacting the environment.” Their eye-catching industrial-style bluetooth speakers are made from 60-80 percent recycled materials, including genuine ex-army 50. caliber ammunition cases and various recycled electronic components. AMPLFY operates out of Substation 33, a recycling, skills and innovation hub that hosts various upcycling, training and transition-to-work programs for people experiencing difficulty finding secure employment. AMPLFY sell ready-to-go speakers and, for those who want to make their own unique, upcycled speaker: DIY kits (with online video tutorials). The DIY kits have numerous options for user customisation, making them an ideal gift for audiophiles who want to explore their creativity. 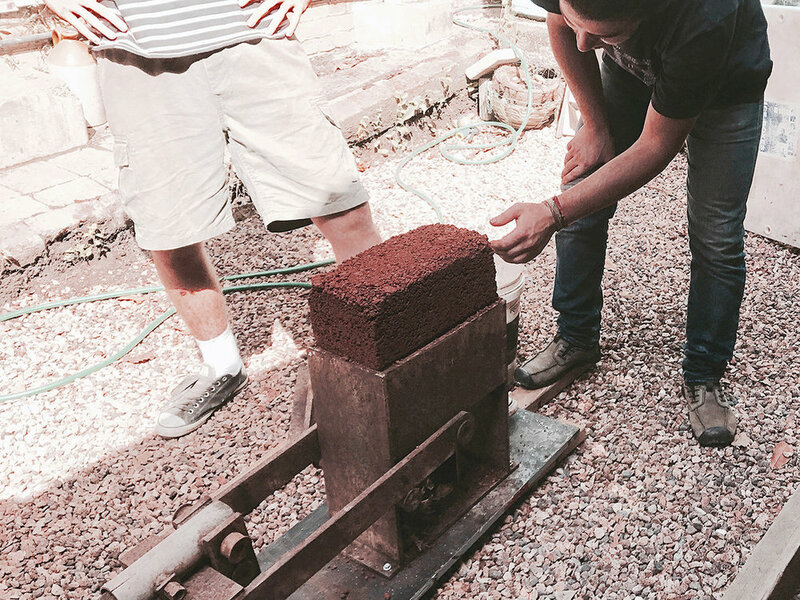 Five Mile Radius’ team experimenting with earth construction techniques with their ‘The Dirt Temple’ project. As young architects, the founders of building design practice Five Mile Radius were overwhelmed by the variety of materials they had to work with. As they put it, “Italian marble laminate from China, timber veneers from PNG. It was hard to know why to use what or where it was coming from.” A trip to India, during which they saw locals making mud bricks from the soil under their feet, triggered a paradigm shift for them: why weren’t they choosing material based simply on their local availability? Inspired, they founded Five Mile Radius in 2016 to explore and promote a self-sufficient future through the use of local materials and end mindless material flows in the construction industry. In one of their projects, an experimental structure north-west of Brisbane dubbed the “Dirt Temple”, they collaborated with soil scientists to analyse local clay before prototyping the various tiles, bricks and pavers to be used for the building. Mammojo’s lactivewear range that feature breastfeeding tops with a built-in bras. After giving birth to her second child, Melita Shirley was frustrated by a lack of breastfeeding-friendly clothing that would also support her postpartum journey back to fitness. Thus, “Lactivewear” brand Mammojo was born. Melia and husband Jonathan spent over two years developing Mammojo’s range of high-quality maternity activewear, which includes breastfeeding tops with built-in bras, cute nursing-friendly baby hoodies and support tights designed with new mothers’ physical needs in mind. Mammojo’s products are made with sustainably-sourced Italian performance fabrics and a part of the proceeds of sales are donated to charities such as the Birthing Kit Foundation, which assists vulnerable women around the world to have a clean and safe birth. Inside the Expresso Train Cafés kitchen. Espresso Train Café is an award winning social enterprise. Espresso Train Café in Brisbane’s northside suburb of Nundah is Australia’s longest-running social-enterprise cafe. 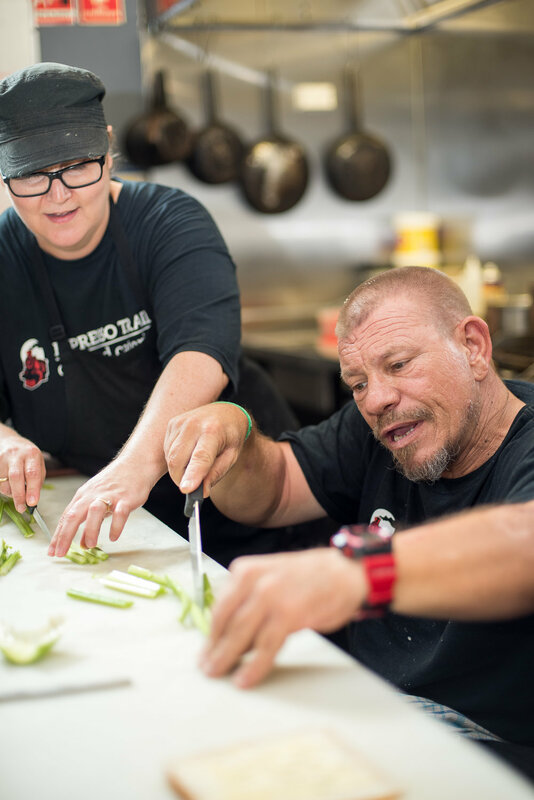 Employing a staff roster of people who might otherwise face barriers to employment, Espresso Train serves a delicious variety of seasonal dishes, all made from scratch on their premises. They also offer catering and operate a food truck known as the ‘Good Food Trailer’. They won Australia’s Best Small Social Enterprise Award in 2015, so they must be doing something right. As an organisation, they recieve no permanent funding and are run collectively through the Nundah Community Enterprises Cooperative. Food Connect’s founder Robert Pekin (left). Food Connect founder Robert Pekin’s journey to social enterprise began with a story of misfortune and discovery. After losing his family farm in the de-regulation of the Australian dairy industry in the 1990s, he came across community-supported agriculture, a model in which people buy shares in the harvest of nearby farms, becoming stakeholders and “sharing its risks and its bounty.” Inspired by this concept, he established Food Connect Brisbane in 2005, which delivers local farmers’ fresh, seasonal produce all over Brisbane. FCB pays farmers around four times what big chains do, so more customer dollars get to the growers. FCB has grown steadily over the last decade, inspiring like-minded organisations such as Sydney Food Connect and CERES Fair Food, and they recently raised more than 2 million dollars through equity crowdfunding via PledgeMe, which they will use to buy their own warehouse and become Australia’s first community-owned local food hub. 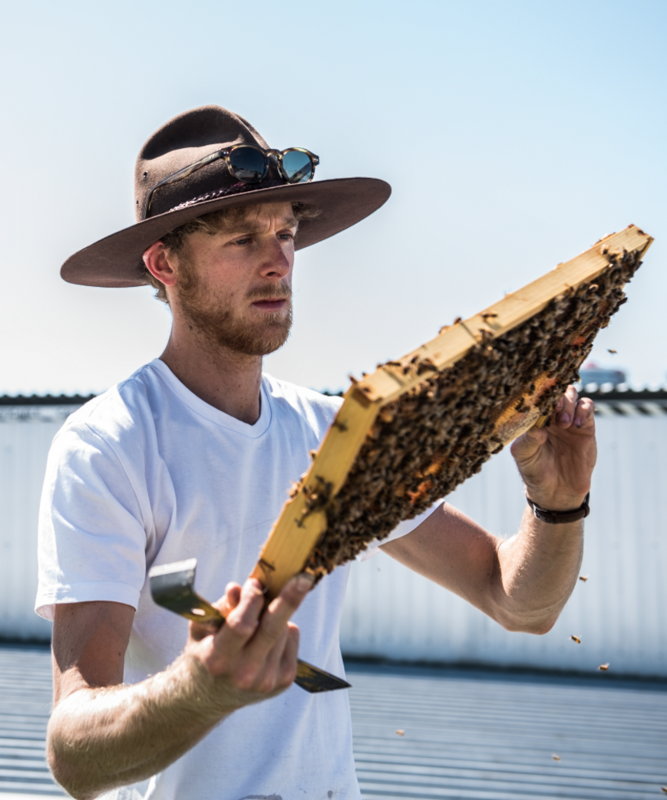 Bee One Third’s director Jack Stone with one of their rooftop hives. There’s been a fair bit of buzz around this unique social enterprise. And it seems right that there should bee. In a nutshell (or beehive/honeycomb perhaps), Bee One Third sets up and maintains beehives on the rooftops of commercial buildings and sells the honey at local markets and online through the Bee One Third Neighbourhood Honey brand. Their mission is to “reconnect communities with the reality of what pollinators do for our food system, our health and our overall well-being. Pollinating change, flower by flower.” “Bees are the connector between flower and fruit and the tissue in the muscle of our food system.” Bee One Third now has 150 beehives under their stewardship across the East Coast, with clients including City Subaru, Roma Street Parklands, Hotel Jen and the James Street Precinct Some of the honey produced is shared with the businesses as a gift of appreciation. Zacharias Szumer is a freelance writer who lives in Naarm/Melbourne. His writing has previously appeared in Overland, Arena, Cyclic Defrost and The Jakarta Post.